A San Rafael law firm is leading the state petroleum industry's charge against regulation, and for the first time is targeting an individual candidate for higher office. The firm, Nielsen Merksamer Parrinello Gross & Leoni, represents the state's leading energy concerns and counts BP, Chevron, Exxon Mobil, Phillips and Valero Energy Corporation among its clients. The law firm created a front group and has poured about $320,000 into an assembly race in San Benito County featuring a county supervisor, Robert Rivas, who was at the forefront of San Benito's Measure J, which banned fracking in the rural county in 2014. Measure J passed despite a $2 million push by Big Oil to defeat it. The controversial oil-extraction process would have been undertaken near the Pinnacles National Park. Thanks to Rivas' advocacy and a motivated local anti-fracking community, San Benito was the first county in the state to enact a fracking ban; a similar effort failed in Santa Barbara, thanks to efforts undertaken by the San Rafael law firm. Monterey and Santa Clara counties both passed anti-fracking initiatives of their own in the wake of the San Benito success. This year, there's a push in San Luis Obispo County to enact a similar ban. Rivas is a Hollister resident who has been on the board of supervisors since 2010. He's running for the 30th District Assembly seat currently occupied by Anna Caballero, who is running for state senate this year. Lobbying disclosure documents on file with the California Secretary of State indicate that Steven S. Lucas is the lobbyist for oil and gas interests at the firm. Having lost its fight against Measure J, according to public records, the firm has now funneled $320,000 into the anti-Rivas front group for campaign advertising, which the Rivas campaign decries as misleading, negative and personal. Among other things, the ads criticize Rivas on public safety. The full name of the front group is the Coalition to Restore California's Middle Class, Opposing Robert Rivas for Assembly 2018. Rivas is running against a fellow Democrat, and lawyer, Peter Leroe-Muñoz for the seat. The primary is on June 5. Rivas' opponent is on the same page when it comes to the contentious extraction process. "I do not support fracking," he says. The petroleum industry's pivot toward targeting candidates for higher office may have future implications for lawmakers across the North Bay who have taken a stand against fracking or against the energy industry. The organization is a subsidiary of front group the Coalition to Restore California's Middle Class, Including Energy Companies who Produce Gas, Oil, Jobs and Pay Taxes. The political action committee has been busy this year accruing contributions from the industry, and its latest filings show that it accepted $2.5 million in contributions between Jan. 1 and April 21. At the end of the reporting cycle, it had nearly $4.5 million on hand after making expenditures of more than $1 million. The organization will likely have several million dollars on hand beyond the June 5 primary this year—but so far, the anti-Rivas front group is the only one associated with Nielsen Merksamer that appears to be targeting a candidate critical of the oil industry. In paperwork on file with California's Secretary of State, the law firm's phone number is listed as the point of contact for the coalition. The firm is located in an office building at 2350 Kerner Boulevard in San Rafael. Besides being the point-of-contact for its oil and gas clients, Steven S. Lucas is identified on the firm's website as an attorney "who also represents numerous wealthy donors who are politically active in federal, state and local levels throughout the United States." Lucas did not respond to phone calls and an email seeking comment. The Nielsen Mersamer website boasts numerous victories on behalf of its energy-industry clients. 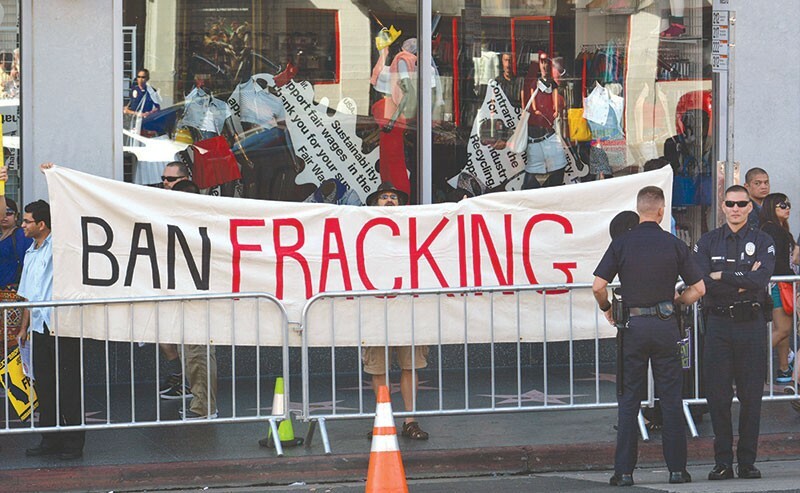 It has been the legal counsel for litigants involved in nearly 400 ballot measures and statewide referenda, and was instrumental in helping defeat Santa Barbara's Measure P, which sought to ban fracking in that county in 2014. The firm opposed the 2006 California Global Warming Solutions Act (AB 32), a landmark bill that aimed to reduce the state's greenhouse-gas contributions to the climate-change crisis. "We advise our ballot measure clients on all aspects of campaigning," the firm's website reads, "from initiative drafting and filing, contesting ballot language and other pre-election litigation, observing and potentially contesting the final vote, and post-election substantive challenges." Rivas was on the campaign trail over the weekend and says he's not surprised at the petroleum industry's moves against him. "That is unfortunately politics in 2018," he says. "Being in this process for the first time, this Assembly seat is a regional office and it's certainly been a unique experience, and it's unfortunate that the oil companies have chosen to play dirty politics by attacking me personally with misleading attack ads and attempts to deceive voters. The fact that I took on the oil industry to protect the community against fracking—that's why I am the subject of these attacks." Rivas believes that the attacks on him will only serve to create bad blood in Sacramento in a political arena that's already fraught with divisiveness. "The civility question—it plays to a larger concern as to why people have very little faith, have very little confidence, in elected officials and government in general," he says, noting that the energy lobby never met with him during the Measure J push. "They viewed my position against fracking as against their interests." According to campaign materials, numerous officials, organizations and citizens have leapt to Rivas' defense, including State Sen. Bill Monning, the Sierra Club and civil rights icon Dolores Huerta. Their support was echoed this week by North Bay Assemblyman Marc Levine, who represents San Rafael in Sacramento and pushed for a failed statewide fracking moratorium in 2012. "I will continue to fight to protect our water quality and coast," says Levine, "and prevent unnecessary and destructive fracking. "Robert Rivas took a bold stand against fracking in San Benito County," adds Levine, "and oil companies want him to pay a price. Fortunately, voters will have the last say." Rivas' opponent also addressed the petroleum industry campaign against Rivas in an interview this week. "Obviously it's an independent expenditure, so we have no coordination with them," says Levoe-Muñoz, who is also a council member in the city of Gilroy and a former deputy district attorney. Citing his law enforcement background, he says, "I can't speak to what their thoughts or motivations are, but I think that what is important is that they are raising an issue around public safety. That's an issue that many residents have raised with me in the district." The petro front group paid for a recent mailer which "addressed that issue in particular around Robert and public safety and cuts that he made while he was on the board of supervisors," says Levoe Muñoz.